Conceptual Rendering of second Freshwater Plaza apartment building. Wangard Partners will expand their Freshwater Plaza development with a new mixed-use apartment building. 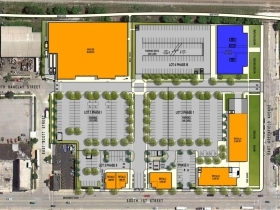 The project, located at the northeast corner of S. 1st St. and E. Greenfield Ave., already includes a four-story apartment building and Cermak Fresh Market grocery store. 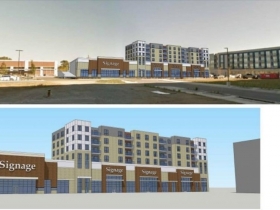 The proposed six-story building comes as a compromise between Wangard, Alderman Jose G. Perez and Department of City Development Commissioner Rocky Marcoux. The three had found themselves at odds with what to do with a site at 200 E. Greenfield Ave. in the southeast corner of the development. 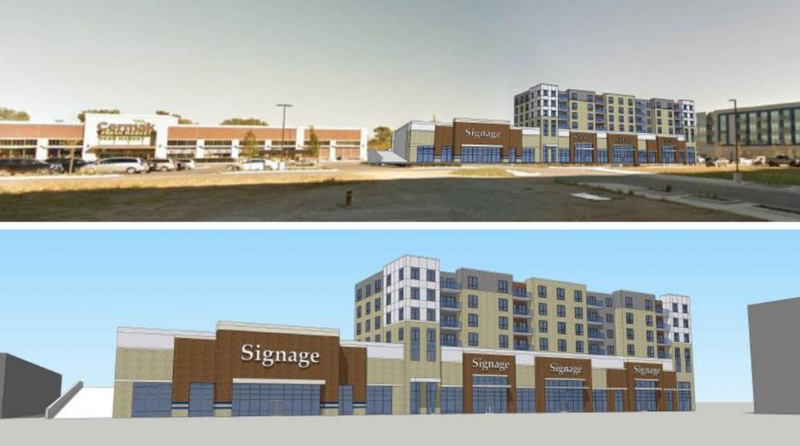 Wangard, with Perez’s support, was seeking to develop retail buildings on the site with potential apartments above. Wangard refers to the anchor tenant in a letter as “a national mid-box retailer,” while Marcoux calls the retailer “a national ‘off price/discount’ retail chain.” Wangard, through Perez, was seeking a zoning change that would have allowed the construction of the retail buildings without the requirements of apartments above. 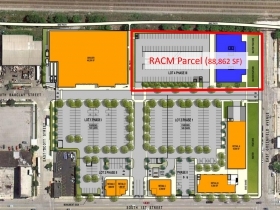 Marcoux, as part of the terms of the original financing deal, was pushing for a three-to-six-story office building that would serve as a gateway to the UW-Milwaukee School of Freshwater Science and emerging Harbor District. Perez in a November 2017 letter to Marcoux said: “This Plaza is a project that could, with the right vision, result in a vibrant neighborhood where people live, eat, play and shop.” Perez said the intended office use would detract from the viability of retail businesses elsewhere in the development. Marcoux said his department would advance the rezoning for the site, but that he would oppose the change. He did just that with a lengthy speech about his vision for the area before the City Plan Commission on January 22nd. The commission, appointed by Marcoux’s boss Mayor Tom Barrett, supported the commissioner’s viewpoint. Then when the project got to the Zoning, Neighborhoods & Development Committee on January 30th a compromise was introduced. The zoning change was switched from the wide open “Industrial-Mixed” to a much more restrictive amendment to the entire complex’s General Planned Development zoning package. The revised plan eliminates the office building and parking garage in favor of a mixed-use building that will line up with the existing apartment building. The zoning change will require the building to be at least five floors in height. Referring to Wangard’s new plan, Marcoux said “essentially what he is suggesting is that we maintain that three-to-six story massing on Greenfield.” The revised building is intended to help the former forlorn E. Greenfield Ave. serve as a gateway to the emerging Harbor District, including the 46-acre Solvay Coke property that We Energies is seeking to redevelop. “We’re trying to bring something forward that is a win-win for the community,” Wangard told the zoning committee. This isn’t the first time Marcoux and Perez have found themselves at odds over the project. Perez pushed for the grocery store to be included in the deal, while Marcoux had sought to land a large office tenant for the site, including the FBI. Perez worked at DCD under Marcoux as an Economic Development Specialist from 2006 to 2009, where they reportedly did not always see eye-to-eye. He was elected to the Common Council in 2012. The Common Council unanimously approved the amended zoning change on February 6th. The new building will have an unusual layout for Milwaukee. Wangard notes that the site, which was formerly a Grede foundry, has soft soils necessitating the parking be placed above the first-floor retail spaces. The six-story building will have commercial tenants on the first floor, parking on the second and an estimated 76 apartments on the top four floors. 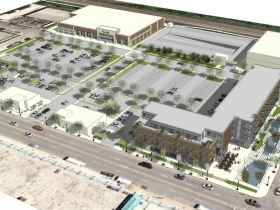 Despite the large amount of surface parking that is part of the first phase of the seven-acre site’s development, Wangard says the parking is necessary. The commercial and apartment uses will allow tenants to share the new garage because they need the parking at different times of the day. 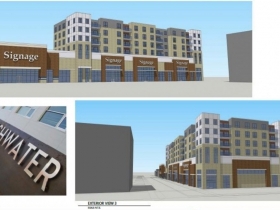 Wangard drew praise from parking garage critic Alderman Nik Kovac for previously leveraging the same successful relationship between their Avenir Apartments on N. Jefferson St. and nearby 1433 Water office building. The base of the building is intended to include approximately 45,000 square feet of commercial space spread across four stalls. Wangard CEO Stewart Wangard told Urban Milwaukee that the firm is currently selecting a project architect from four different bids. The first apartment building was designed by Eppstein Uhen Architects. The firm will eventually need to return to the city for final design approval on the project. The first apartments built here, known as the Freshwater Plaza Apartments, are full and a wait list has formed for future tenants. Because the project was financed in part by federal New Market Tax Credits, Wangard must set aside 20 percent of the units at below market rates for moderate-income residents. They opened last summer alongside the grocery store. A water feature at the complex, which traps water on site before sending it into the sewer system, recently received a Green Luminary award from the Milwaukee Metropolitan Sewerage District. The feature was designed by the students and faculty at UW-Milwaukee. Wangard has had tremendous success attracting retail tenants to the building’s first floor. The building’s tenants include Tribeca GalleryCafe & Books, MODD by Luci, LyLy Nails & Spa, Jimmy John’s, Sprint and UPS. 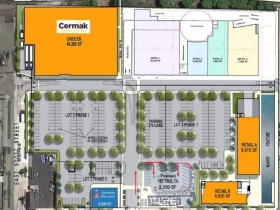 Elsewhere in the development a Sherwin Williams paint store has been approved along S. 1st St. It’s expected to be the busiest Sherwin Williams store in the region. A second outlot building is planned along S. 1st St.
Modd didn’t last the year, and is long gone. Now there’s a new Great Clips though. Many urbanism fans will decry the “suburban” design of the plaza, but the apartments are full, Cermak has been a boon to the neighborhood, and is busy in one way or another at all times of day. The coffee shop could use a lot more business though. Thumbs up on the added density. The out lot buildings are an enormous disappointment given what was achieved on the corner of 1st and Greenfield. They should change the name to La Follette Point. Walker’s Point has a really, really bad ring to it. Hope the developer will ask and listens to what type services are needed to support the local, longterm community and not just the new apartment residents. The current design is very disappointing, it could be anywhere in the City, has no energy, excitement or local flavor. Please reconsider the design and reconsider the 1-story out buildings along 1st Street. How about using that financing package for the parks?? Why can’t these developers secure their OWN financing just like us regular folk? And BTW–do we not have enough chi-chi apts, boutique restaurants and specialty retail that never seem to last?? @JL Drost – Difficult to use TIF on a park, because it relies on incremental property tax revenue. Parks are untaxable as they’re government owned and therefore don’t generate incremental revenue themselves. The water feature was paid for in part by the TIF, which works because it was new and accompanied by development that will generate incremental tax revenue. A similar use of TIF is being used to a build a new park on E. Erie St. with tax revenue from the DoMUS apartments. The award winning water feature is now fully surrounded by no trespassing signs because it was being used by the homeless to bathe and launder their dirty clothing. I personally witnessed it more than once mid-day in broad daylight. Big improvement over brownfield and parking crater that defined the east half of walkers point until a couple years ago. The entire 1st street corridor through walkers point should be a logical continuation of the type of urbanism from water street in the north and KK in the south. One thing that goes under appreciated with this development is that it maintains the street grid on Barclay, which has a number of adaptive reuse historic buildings and developable lots. Has the chance to quickly becone a really nice corner of the city.